Hit up Latak Jhatak for beautifully handcrafted brass jewellery and handloom khadi cotton sarees. Their diverse and unique designs are on point with the hottest trends and are sure to make heads turn. Brass is an alloy of copper and zinc, and has long been prized for its artistic appeal. Taking advantage of its antique sheen, flexibility and affordability, Latak Jhatak’s local artisans are breaking away from traditional designs and making stand-out pieces of jewellery. Whether you are a fan of the steampunk inspired charm or into something dainty and delicate, Latak Jhatak may just have the brass jewellery piece you've been looking for. 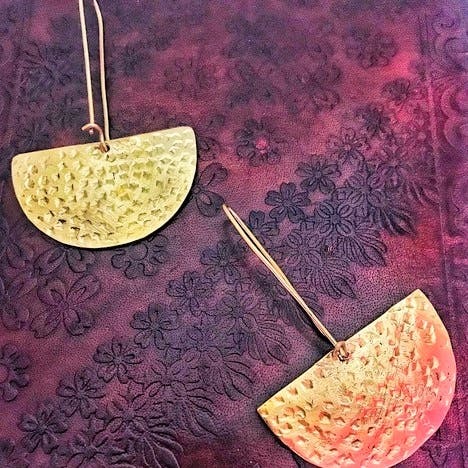 Check out their Instagram and you will be surprised by the range of brass jewelry from large, dramatic hoops to dainty beaded earrings - from charming vintage to contemporary chic. Latak Jhatak’s brass jewelry is not for the faint of heart. The sheen of brass is sure to draw attention to your accessories from those who are fashion conscious. So, if you wish to shake things up with your OOTD, consider accessorizing with their jewellery. We are totally crushing over the Peacock piece, handcrafted from pure brass sheets by their craftsmen from Jaipur. Apart from earrings, we would love it if they could add some more designs to adorn wrists and neck. While you are scanning their Instagram feed for jewellery designs, do not miss out on the range of gorgeous khadi cotton kantha sarees and Bengal tant weaves on pure muslin.